One of the things I loved most about living in Hawaii was that outside the tourist zones, local people tend to make eye contact and smile on the street. They strike up conversations in public places like standing in lines at the grocery store or the bank. The latter habit drives some newcomers crazy because the people chatting with the bank teller make the lines move slowly and being asked what you are cooking with what you have in your cart can seem like an inquisition to someone not used to what locals call “talking story.” Living in Hong Kong for a year, I miss those friendly interactions with strangers. They made me feel visible and part of a community. Hawaii has a million people spread over a little over 4,000 square miles. Hong Kong has over seven million people crammed into 1,311 square miles. In a place where you have to dodge each other to walk through a mall or cross the street and are literally pressed up against each other in subway cars, avoiding eye contact and zoning out on your headphones and phone is the way people create the illusion of space, insert a sliver of privacy even with someone’s backpack digging into your arm. Unintentional eye contact is quickly averted. Accidental body contact is never acknowledged. You learn to insulate, to be immersed in crowds yet see no one. It’s easy to forget that everyone has a story. The other night my husband and I took a musician friend visiting from Hawaii to the dai pai dong (outdoor neighborhood restaurant) in Fotan. 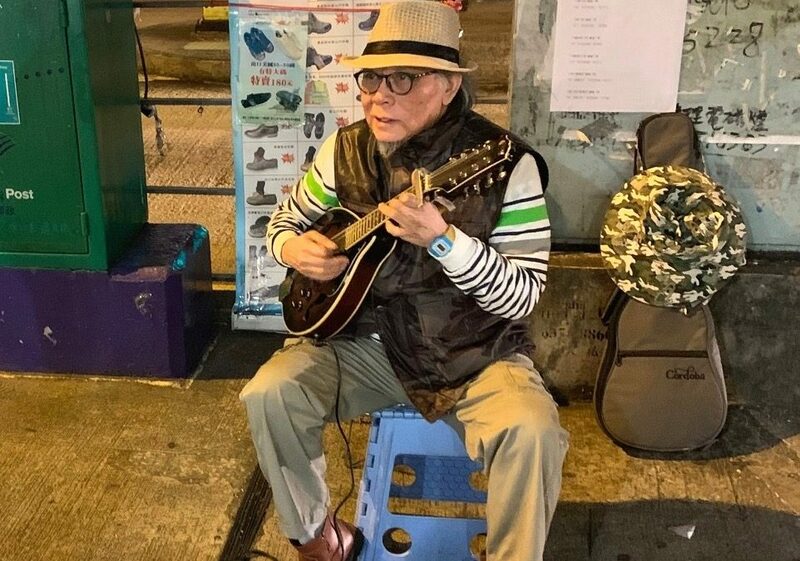 On our walk back to the MTR, we heard the tinkly sounds of a mandolin. We tracked the music to a dapper old man sitting on a stool across the street from a fancy housing estate. His mandolin was hooked up to a small amplifier, and he played well, but it was late and no one was stopping. I nudged my husband to give him some money, so he dug out some change and back-tracked to drop it in the tub by the player’s feet. He also stayed to hear the end of the song. And then to comment on the instrument and the song, which got him a gap-toothed smile in appreciation that not only had he stopped, he also knew about music. That led—as the friend and I heard in the recapped translation—to my husband hearing about the clubs the musician used to play and finding out how many nights a week he busks by the metro station. And the granting of a song request and more appreciation that he knew the old songs. We walked into the metro station feeling like we’d just had a Hawaii-style encounter in Hong Kong. I saw it as a reminder not to pull so far in that we forget to reach out.